Signature Arts, Inc.: RR Auction Doesn’t Do The Right Thing! RR Auction Doesn’t Do The Right Thing! What’s wrong with Bob Eaton of RR Auction? Does he not have common sense? When someone comes to any legitimate autograph dealer or auction house and they offer for sale an “Official” legal document belonging to the United States of America, what is the first thing you would think of? You are absolutely right, no question, it’s stolen! That light bulb doesn’t go off inside Bob Eaton’s head. Someone offered Eaton a United States Customs Declaration filled out and signed by Neil A. Armstrong and Eaton went for it. When was the last time anyone saw an original United States Customs Declaration for sale, anywhere? 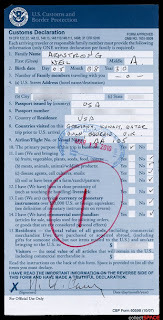 It is said this form was allegedly stolen by a U.S. Customs worker who along with a cohort tried to pass it off through RR Auction based in New Hampshire. The two men will face a federal grand jury and if found guilty of stealing an official government record they could face 10 years in prison and a very hefty fine of a quarter million dollars. What about the dimwit who tried to sell it at auction?????? Isn’t the seller part of this fiasco? It is our opinion, proper procedure would have been to get as must information as possible from the consignor, take possession of the item and immediately call the authorities. That is the right thing to do, not participate in the sale of an obvious stolen document that should be in the files of the United States Government. Armstrong was returning from his well publicized trip overseas visiting U.S. troops as part of the “Legends of Aerospace Tour.” His March 13th American Airlines flight 105 from London to New York was diverted to Boston, Massachusetts due to inclement weather. One of the customs inspectors at Boston was Thomas Chapman and he received the Customs Declaration from Neil Armstrong. 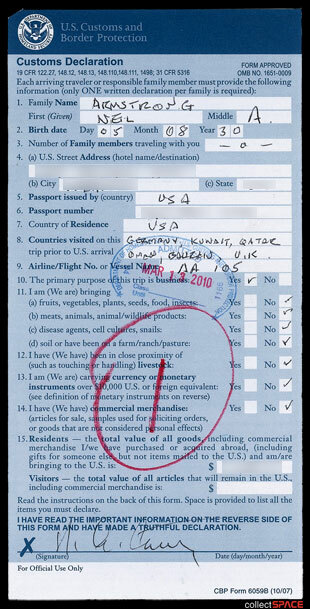 Instead of filing the form as required with Homeland Security officials, it is said Chapman kept the document. Chapman showed the form to his friend Paul Brickman and the two located an unidentified individual who had experience dealing in autographs. The item was consigned to RR Auction and with a ridiculous opening bid of only $200 in their May 22, 2010 auction. Bids exceeded $1,000 before the item was seized by Homeland Security.